Fuller’s Graduate Development Programme: Could you be a leading light in Fuller’s future? Here at Fuller’s, history and heritage means a great deal to us - but we’ve always got one eye fixed on the future too. That’s why we put time and effort every year into finding, developing and supporting our next generation of brewers, business leaders and pub managers. We do it via two outstanding graduate schemes; one based at the brewery itself (our Graduate Development Programme) and the other (Fast Track to Pub Management) based across our estate of pubs. Both schemes offer young people the opportunity to become a leading light in Fuller’s bright future. The Graduate Development Programme at Griffin Brewery is a flexible two to two-and-a-half year course, with the next intake starting in September 2017. For high-achieving students with the drive and talent to succeed, it represents a fantastic opportunity to learn all about an established and iconic British business - allowing you to undertake a wide range of roles across Fuller’s during a series of six-month placements. We choose the first two placements for you, and after that, the rest of the programme is tailored to your individual career goals. So even if you’re unsure as to what you want to do for a career, this is a graduate scheme that helps you discover exactly what it is you love. It might be co-ordinating promotions in our pubs, working out distribution logistics, exploring energy efficiency in our kitchens or even applying the science of beer-brewing in the brew house itself. Whatever’s right for you, we support you every step of the way. Support comes in various forms. Throughout your placements, you meet your programme manager for monthly catch-ups, and attend regular training events and workshops both at the brewery and externally. After six months, you also receive a mentor - a Fuller’s senior manager who will aid your development as you begin to focus on the areas you may wish to pursue full time. Everything is geared up to helping you find the right role - one that you can both excel in and enjoy. 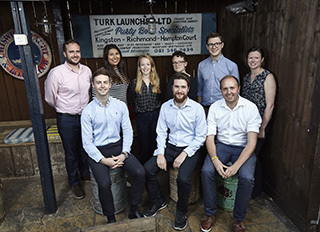 If the Fuller’s Graduate Development Programme sounds like something you might be interested in, head over to our careers website, where applications for the scheme’s next intake are now open. The closing date for applications is 23rd December 2016. We’ll then be conducting telephone interviews with successful applicants until mid-January. Select candidates will be invited to an assessment centre in February 2017, before the short-listed few are given a final interview in late March / early April. You can find out more about this process by reading the experiences of some of our previous graduates here. Graduates who, having completed the course, are now playing key roles in Fuller’s continued success story! Join the Fuller’s family – head over to our jobs website to find out more.